Wells Fargo had identified “Underbanked” users as an opportunity for them to create a service for an underserved market by most commercial banks. During a Discovery phase, we deep-dived into learning about their pain points and needs. I worked with a team to conduct interviews, ethnography studies, and focus groups to get to know them. How can we better understand the Underbanked and their needs? With 34 million US households classified under this user group, that’s a lot of people with unmet banking needs. These people often live paycheck to paycheck, and rely on non-traditional financial services and methods. Some of the (many!) fintech apps I tried out. To start immersing myself in the Fintech space, I started keeping a microblog to document the latest in banking, millennials, the underbanked, UX, and other related current events in the industry. In this blog I document the newest FinTech startups and record some quick thoughts on found articles. Many Fintech startups specialize in one type of financial service and concentrate on improving experience. If using any app, our target market was likely to use Mint, but Mint doesn’t provide a complete picture of the financial health. I looked at fintech and non-fintech experiences and identified what they were doing well. Banks have the advantage of a larger infrastructure, customer awareness, and decades of big data. There is opportunity available to them if they can overcome the friction of traditional business methods and their undesirable reputation. The Underbanked are typically gig-economy workers who suffer from volatile income, and struggle with day-to-day finances. What are their largest pain points? Through workshops with product stakeholders and UX researchers, we brainstormed different pain points that they encounter, and then affinity diagrammed to categorize them. We concluded that bills, spending, income, and savings are the four main components that give insight into someone’s financial health. Expenses are our users’ number one stressor and top priority. Everyone uses different systems: shoe box with cash, physical envelopes, calendar, spreadsheets, etc. Their income comes in varied amounts and at a random frequency. They are paid in different methods. They often have no emergency fund and sometimes use untraditional methods: a family member “hides” money from them, or they save on prepaid cards. Need #1: To have a real-time view of spending habits. People want immediate syncing between their transactions and account balances. There are plenty of apps that display surface-level spending trends, but none provide a complete snapshot of how these trends integrate into your overall financial health. Other apps often display your spending trends after you’ve made a transaction, sometimes at the end of the week when all has been said and done. What if these insights were surfaced in real-time and influenced your spending decision in the moment of the transaction? Need #2: To have a solution that is custom-fit to their lifestyle. A large portion of the underbanked have variable income and live paycheck to paycheck. The amount and timing of their income often varies and may not align when it comes time to pay the bills, so they are left with the burden of prioritizing and compromises. As a result, many have little or no funds set aside for emergencies. No matter your income bracket, life events happens, bringing unexpected expenses. Users felt there were no personalized solutions for them. How can we create a system that recognizes these lifestyle differences and allows for flexibility? Need #3: To feel like they are truly in control. Being in control of their finances means being in control of their life. There is a strong desire to feel in control of how money is moved to and from their account. For example, when paying bills, they are used to manually sending payments. There is a distrust with automation; having bill payments sent automatically is a daunting concept. After synthesizing the findings from ethnography studies, we brainstormed values that we thought would be important to users based on their key needs. Affinity diagramming these values allowed us to form our design principles. To see the result of how I took what I learned from user research and applied it to product thinking, take a look at my case study for designing Greenhouse. 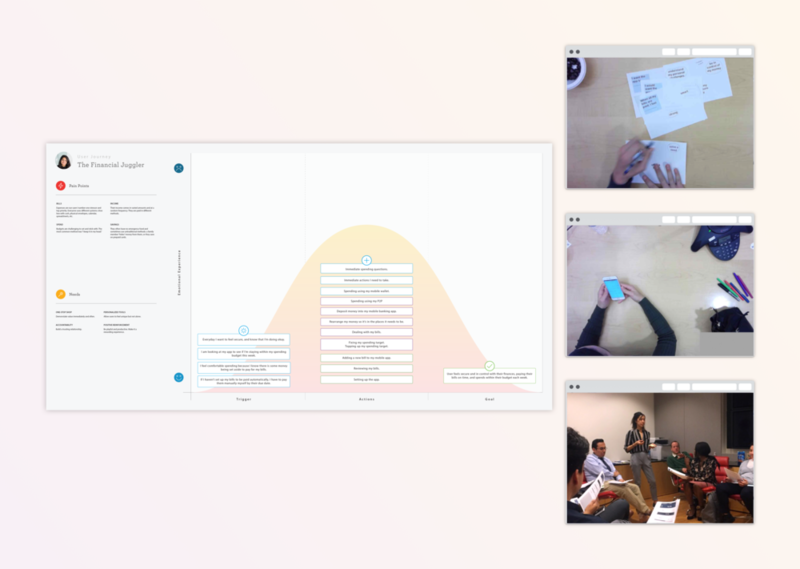 Working with a content strategist and UX researcher, we conducted a myriad of tests with our prototypes. These were a combination of sessions conducted by either the UX researcher or myself. We wanted to get our designs in front of people as often as we could so that they could break it. Using the wireframes I designed, I A/B tested, used heuristic evaluations, conducted group surveys, and individual interviews. After each round of user testing there would be a debrief with the rest of the product team with results and suggested solutions based on key findings. Tailored recommendations to set aside money based on income and expenses. 📍 Check out my portfolio, my creations, peek into my life, get to know me.